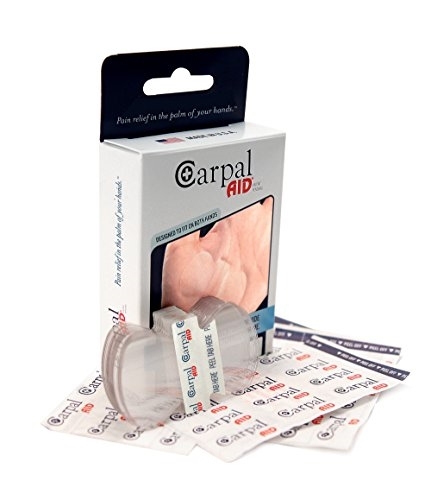 Carpal Aid is designed for the temporary relieve of symptoms caused by Carpal Tunnel Syndrome. It is a non-invasive medical device that sticks on the palm of the patient’s hand. Carpal Aid is a single use disposable product that can be worn on either hand to alleviate symptoms of Carpal Tunnel Syndrome wherever and whenever needed – at work, on the go, or even overnight! The skin lifting mechanism developed by our research and development team provides the median nerve with the respite required from the compression that it has succumbed to. By lifting the skin above the Carpal Tunnel ligament in the wrist/palm area, the pressure applied to the nerve is removed. Carpal Aid is great for people suffering from Carpal Tunnel Syndrome aches and strain from hands-on occupations or repetitive motion. Jobs that involve repetitive wrist movement include manufacturing, assembly line work, keyboarding occupations, grasping tools, scanning groceries, construction work and many more. Each package contains 20 Carpal-Aid strips and there are 6 packages per bundle.